Recently she returned to her roots at St. Bonaventure University, where she crafted a “Large and Terrible Frog” puppet for the spring ’13 production of A Year With Frog and Toad, and is looking forward to working on the design team of the spring ’14 production of the new play A Frontier. Other projects include puppet design for Company One’s production of She Kills Monsters (Boston, MA), prop designs for Company One’s Love Person and The Brother/Sister plays, and prop designs for Metro Stage Company’s Bat Boy the musical and Chicago (Boston, MA). Her first puppet design for the stage was The Cunning Little Vixen with Boston Opera Collaborative in 2009. As one-half of the creativity behind Free Hands Puppets (a title she shares with Boston theatre artist Phil Berman) she designed the puppets for the original folktale Three Blessed Brothers, which was performed as part of the Cambridge Riverfest programming in the summer of 2012, and further workshopped as part of the Boston University New Play Initiative in the fall of 2013. 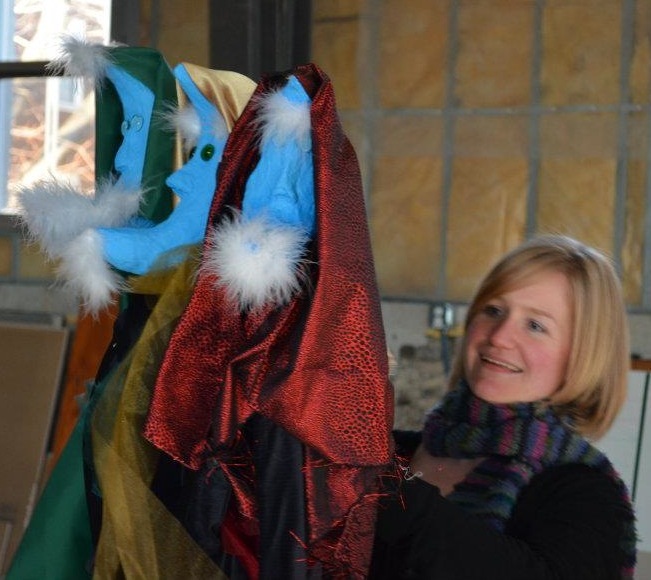 She also designed and directs annual performances of The Nativity Story, a touring Christmas puppet show in the Italian marionette style, and is developing her first solo show, Strega Nona, which she hopes to workshop toward premier in the coming year. She is an alum of the Freedom Art Retreat, a program of Playwright’s Commons, a playwright development organization whose mission is to strengthen the Boston and New England theatre ecology, and the Company One Playground, organized in the summer of 2011 to help foster communication among playwrights and theatre artists. While puppetry is her current love, Alexandra started her theatre career as a stage manager in Chicago, IL. She spent several years with Silk Road Theatre Project as both a stage manager and production manager, often working with staged readings and brand new plays in various stages of development. It was while moonlighting as the prop designer for the Quest Ensemble (Chicago, IL) production of Into the Woods that she first experienced puppetry and live theatre sharing the stage, an experience that went on to have a strong effect on the rest of her career. Alexandra is an alum of St. Bonaventure University, where she majored in English and fell in love with theater as a profession. She did three years of professional internship at the Chautauqua Theater Company, and spent some time at Boston University working toward her MFA in Theatre Management. She has built sets, hung lights, driven big trucks through cities, sewn on buttons, built risers, moved chairs and made lots of coffee. She grew up outside Buffalo, NY.